Practice sessions for Flogging Molly’s Matt Hensley used to be a pain. He’s been in North County for decades. 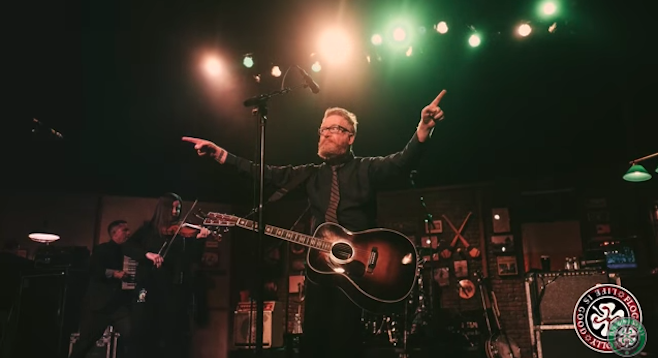 The other six Celtic punkers lived in greater L.A.
Flogging Molly, "Life Is Good"
Wednesday, March 14, 2018, 8 p.m.
Life Is Good, Flogging Molly’s sixth studio album, was released last summer. But last Wednesday (January 17th) Hensley had a full-circle moment: he played a local bar he had an ownership stake in and he didn’t have to worry about paying the bills or broken tap handles. Along with Tony Hawk, Hensley has become a minority owner of Black Plague Brewing, located in the Tri-City area of Oceanside that started hosting live music last summer. Hensley played with Brogue Wave, his San Diego–based Irish music side project that, compared to Flogging Molly, is more trad and less thrash.